SWF files with one-colored vector image can be used as cliparts in Product designer. Cliparts with .swf extention can be made in different vector editors, for example Adobe Flash IDE, Adobe Illustrator, etc. Also, you can upload png, jpeg or gif images in clipart categories that have a good enough quality to print. But if you wish to resize cliparts without loss of quality and change a clipart color, upload only .swf files. You can categorize cliparts. To create a clipart category, please log in to the admin panel and go to Content -> Product Designer -> click "Clipart categories" in the left hand menu. On this page you can edit/delete clipart categories and choose a clipart category status (Active or Disabled). Name - Type in the name of the clipart category you are creating. 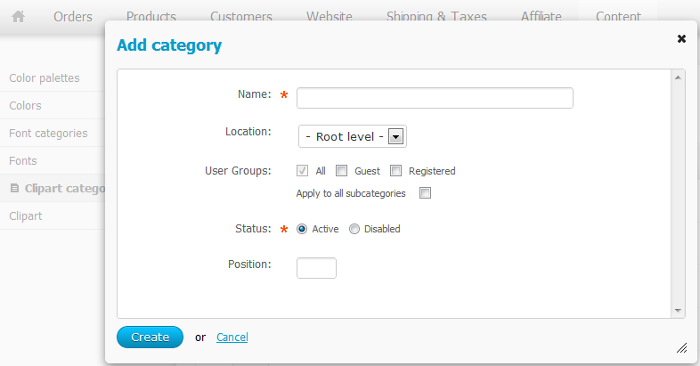 Location - Choose "Root level" if you are creating a main category. If you are creating a sub-category, choose a main category for it. User groups - Here you can specify what user groups can use this clipart category. Status - Active - clipart category will be visible to users; Disabled - clipart category will not be visible. 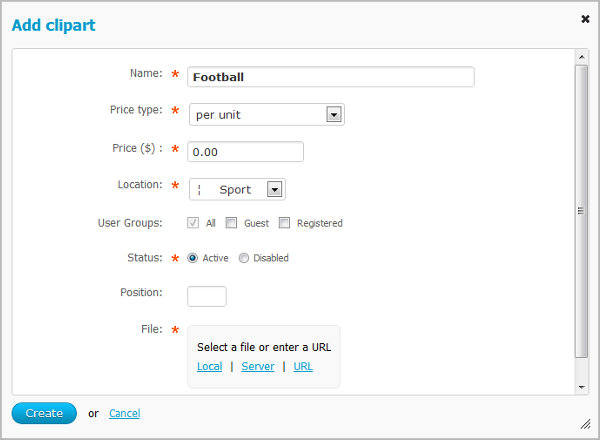 Press Create button to create the category. In the admin panel, go to Content -> Product Designer -> click "Clipart" in the left hand menu. On this page you can edit/delete cliparts and choose a clipart status (Active or Disabled). Name - Type in the name of the clipart. Status - Active - clipart will be visible to users; Disabled - clipart will not be visible. File - Upload your clipart file here.